I don't go fishing to escape my life, I go fishing to live my life. Motoryacht Remember When is fully equipped for fishing, and our 42' Towed Tender (Invincible) provides the perfect setting for all fish-related adventures. 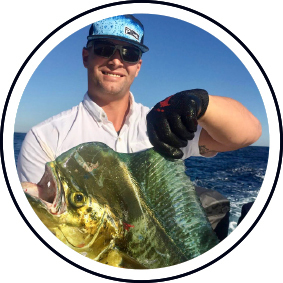 Our crew is vastly experienced in fishing from the Bahamas to Central America and the Caribbean and are able to guide beginner anglers and assist seasoned ones alike with everything from the technical aspects of fishing, the right gear and gadgets for each job and the best fishing spots to explore at the perfect time of day. 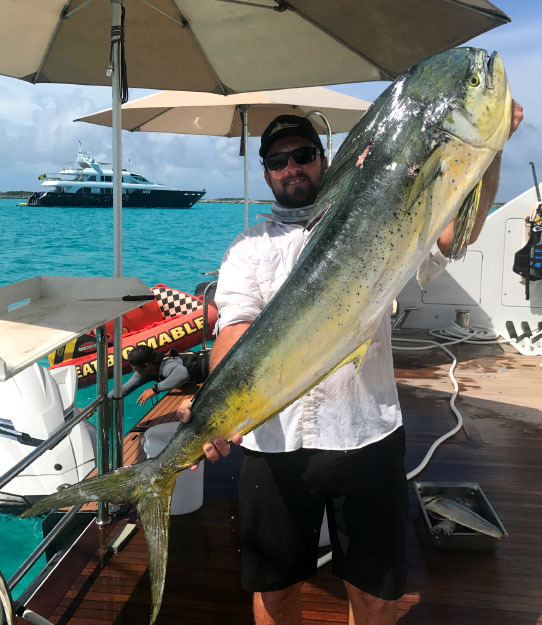 Whether you dream of a luxury fishing yacht charter, or just want to give fishing a first try, Remember When’s fishing program is sure to deliver an unforgettable day on the water. Fishing Technique: Bottom fishing with live bait which is bridle rigged with a single circle hook. Best Time to Fish: Early morning or late afternoon. The best Moon phase is always ¾ full moon to 1st quarter after full moon. The best tide in the Bahamas is the run-out tide. Fish Description: The Cubera Snapper's eating quality is excellent but the larger ones run the risk of carrying Ciguatera poisoning. Has Remember When ever cooked this fish? Remember When has cooked smaller Cubera Snappers and they are delicious indeed! Fish Description: Lionfish are delicious and taste like a cross between a Hog Snapper and a Grouper. The flesh is firm and white. Once the venomous spines have been removed, you can treat a Lionfish like any other good eating fish. 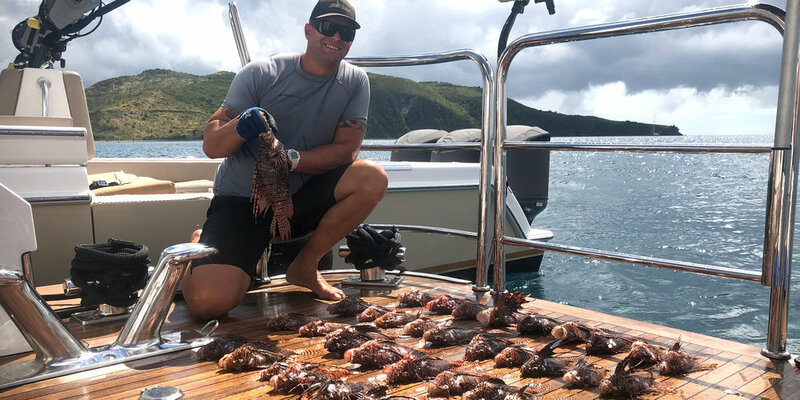 Lionfish can be cooked all kinds of ways, and the flavor of the fish is mild. They are excellent fried, blackened, and sautéed. Fillets are prepared the same way as whole fish, or served in tacos. Fishing Technique: Jigging artificial crabs on the sandy area next to underwater reefs. 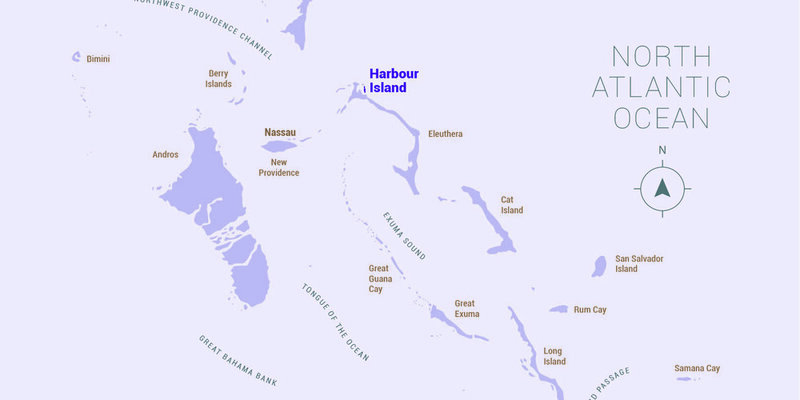 Best Time to Fish: Early morning and late afternoon on sandy flats or gullies between islands. Fish Description: With its firm, fleshy white fillets, the Permit are delicious to eat and it is very tasty and succulent baked in the oven or on the grill. Best eaten when on the small side. Fishing Technique: Trolling a Ballyhoo rigged with a colorful skirt, double hooked. Best Time to Fish: Sunrise to sunset around weed lines or floating structure in water depths of 600 feet or more. Best at ¾ full moon to 1st quarter after full moon. Best tide is run-out tide. Fish Description: Mahi is a firm-fleshed fish and is very good baked, broiled, grilled or fried (in olive oil). It has a mild taste with a sweet juicy flavor. Fishing Technique: Hawaiian sling or pole spear. 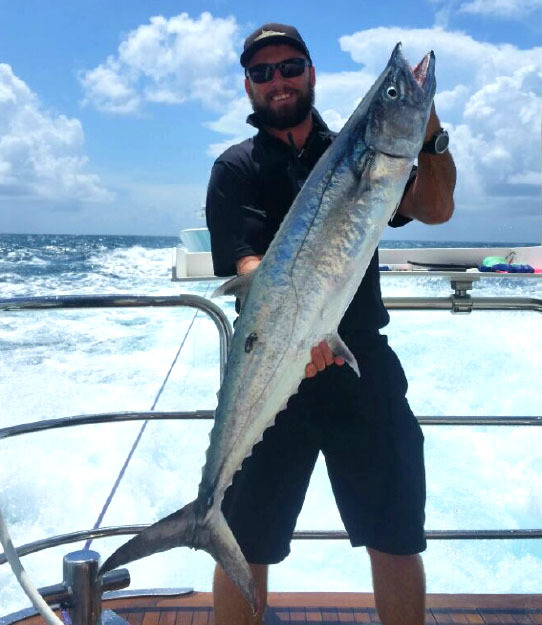 Best Time to Fish: Early morning or late afternoon around wrecks, drop offs or scattered reef on sandy areas. Fish Description: Lobster has a mild and slightly sweet taste with the texture somewhere in between shrimp and crab. Lobster is chewier and a bit spongy in texture because of its high amount of protein, especially the meat in the lobster's tail. Steaming and boiling are the two most common ways to cook lobsters but you can also grill lobster. Lobster meat may be dipped in butter, resulting in a heightened flavor. Fishing Technique: Deep dropping in water 600 feet to 1000 feet deep. Squid is the best bait! Best Time to Fish: Any time during the day, but run-out tide is the best. Fish Description: Snapper has a lean, firm texture. The flesh is white, delicate and mild and it is tinted pink from its red skin. The flavor of the meat is slightly sweet, and flaky—great for fish tacos. You can bake, fry, pan sear, sauté or grill Snapper. Fishing Technique: Freediving with Hawaiian sling or pole spear. Best Time to Fish: First three hours after sunrise and last 3 hours before sunset. Fish Description: Black Grouper is a lean, moist fish with a distinctive yet mild flavor, large flakes and a firm texture. Black Grouper meat cooks up very firm with big flakes and holds its moisture better than many other fish. Fishing Technique: Live bait, single circle hook, bridle rigged while drifting offshore over the edge of a shelf. Best Time to Fish: Early morning or late afternoon during run-out tide. Fish Description: Yellowfin Tuna has a medium-mild flavor with very firm texture. It tasted great raw, grilled, baked, broiled, blackened, pan seared, or smoked. It's a preferred tuna for sashimi (thinly sliced raw fish). Fishing Technique: Trolling a Horse Ballyhoo with a small pink artificial squid skirt over its bill. Best Time to Fish: Early morning and late afternoon, especially the last hour after sunset. Run-out tide and ¾ full moon until 1st quarter after full moon. Fish Description: Blue Marlin has a mildly pronounced flavor with a very firm, almost steak-like texture. Blue Marlin is very good grilled or smoked. Fishing Technique: Trolling a Ballyhoo rigged with a black and green skirt. Look for murky water to troll in, sudden drop offs, depths of 90 feet to 300 feet. Fish Description: King Mackerel have a rich and flavorful taste and is a stronger tasting fish than many, with an oily flesh. Good when baked, broiled or grilled. Fishing Technique: Sliced pilchard wrapped with fresh squid around a tiny piece of foam and secured with ghost cotton. Use a small circle hook. Fished on the bottom of grassy areas with s small sinker in water 10 feet to 40 feet deep. Best Time to Fish: The last hour before and after sunset, any tide. Fish Description: It has the taste of other Snappers, but with a lot more meat. Like most of the Snapper family, the meat is white, flaky, slightly sweet and light, and is excellent prepared in a variety of ways. You can bake, fry, pan sear, sauté or grill Snapper. 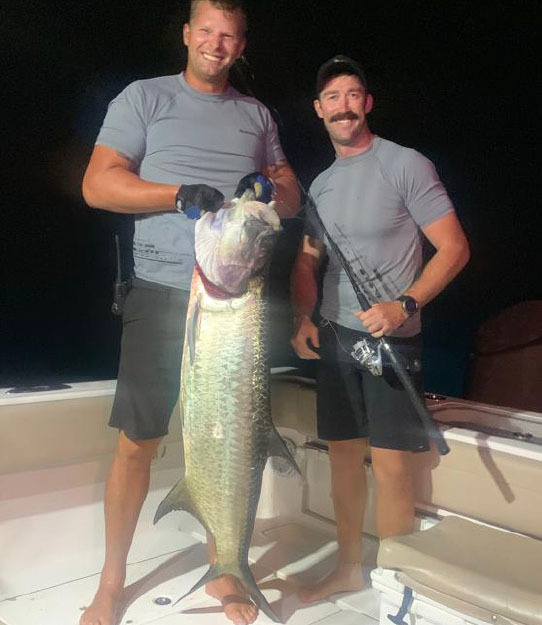 Fishing Technique: Trolling a rigged Horse Ballyhoo on a green and black skirt with 30 to 60 ounce trolling weights at speeds of 8-10 knots around offshore pinnacles or floating structure and weed lines. Best Time to Fish: Early morning and late afternoon during run-out tide. Best at ¾ full moon until 1st quarter after full moon. Fish Description: Wahoo has a mild-sweet tasting white flesh with a firm texture, moderate fat, and large, circular flakes when cooked. It is best baked or grilled. Fishing Technique: Sight fishing, floating live shrimp on a single circle hook or casting a small white bucktail jig. Best Time to Fish: At night around the boat or during the day around weed lines offshore. Fish Description: Tripletail filets are not thick, but the firm white meat is tasty and often compared to grouper and snapper. It is delicious when pan roasted, baked or grilled (skin side down). Fishing Technique: Trolling Ballyhoo rigged with a black and green skirt. Look for murky water to troll in, depths of 90 feet 300 feet. Best Time to Fish: Early morning to late afternoon during run-out tide. Fishing Technique: 3ft. pole spear with Lionfish ZooKeeper. Best Time to Fish: Sunrise to Sunset. Best Time to Fish: Sunrise to Sunset around weed lines or floating structure in water depths of 600 feet or more. Best is ¾ full moon to 1st quarter after full moon. Fishing Technique: Free diving with pole spear. Fishing Technique: 6inch pearl white Strikepro surface lure. Best Time to Fish: First 3 hours after sunrise or 3 hours after sunset around boats, docks or over sandy flats. Fish Description: As a bony, strong-smelling saltwater fish, it may be more trouble than pleasure to eat. One practical method of preparing a bony fish is to poach it, pick the meat off the bones and use it to make well-seasoned fish cakes.